This is not a restaurant review. Because I don’t do restaurant reviews. I eat out a lot, yes, but most times I end up in less-than-lofty establishments since there’s a picky 5-year-old in da house. Friends and neighbours do regularly ask for my recommendations and, as a food writer, I tend to stay on top of the restaurant scene even when I don’t get to go. 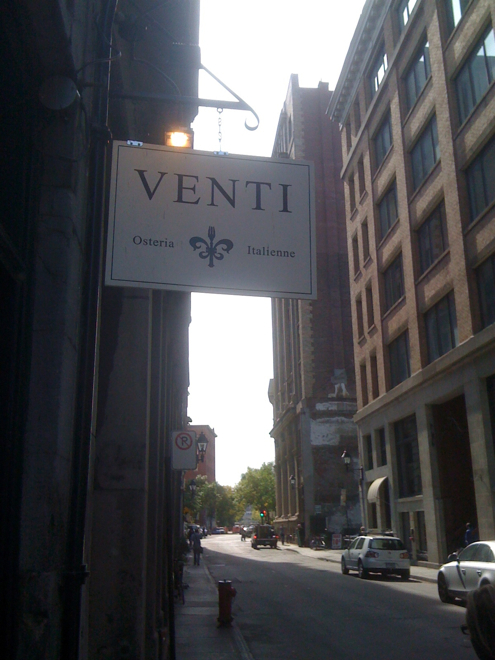 So this post does not to pretend to be anything but a love note to Venti Osteria in Old Montreal, a fairly newcomer to the local food scene although chef and owner Michele Forgione has built a well-deserved reputation at previous establishments. Since I follow chef Forgione on Twitter, I already knew that this restaurant is a dream come true, his niche of northern Italy on foodie St. Paul Street, opened with trepidation and pride a few months ago. Everyone was raving about it (see an honest-to-goodness review here by Gazette’s gangster critic Lesley Chesterman), so I was dying to go. And go I did, with a friend of mine whose birthday I had missed. When the waiter arrived, we did something I love doing: we asked that the chef choose the menu for us. This is my favourite way of eating out at a fine restaurant and why I love tasting menus so much. I still remember, years ago, when friends and I asked chef Marc De Canck of La Chronique to send out all his starters in lieu of a meal. It was the bomb. 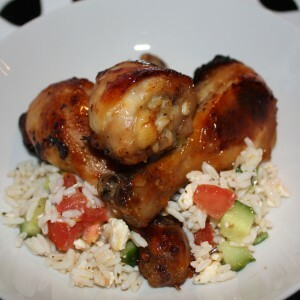 Is it only me, I find that starters often shine brighter than entrees? They sort of encapsulate the fantasy and vision of the chefs more? The unending tapas trend could be a case in point, maybe. At Venti, part of the kitchen greets you the moment you step in. Here was chef Forgione and his brigade making bread, pasta and what not. Counters were covered in edibles. In fact, everywhere I looked was food that inspires and entices. So we let the chef and his team take care of our menu, which they did superlatively. I already know I will go back to Venti very soon, with the picky 5-year-old in tow, who can’t help but be swayed by the bit-of-rustic, hint-of-fancy food. 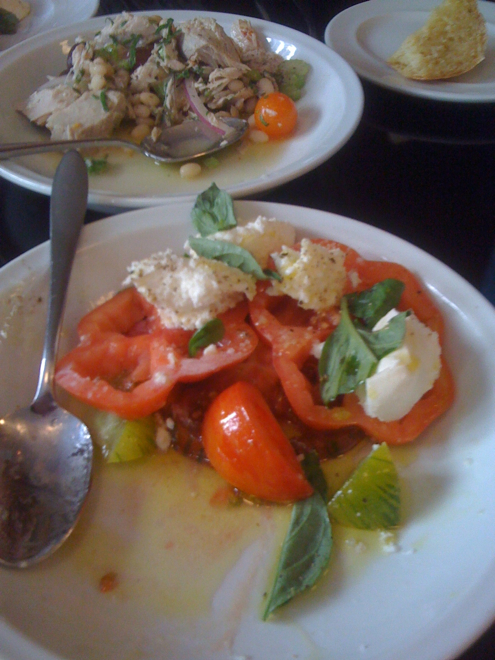 I leave you with images of our meal, snapped with a 1st-generation iPhone that was not up to the task. 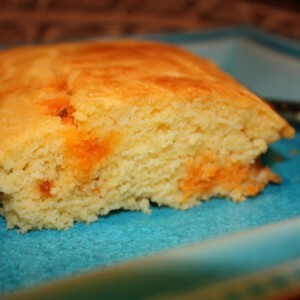 That everything but the photographs looks so good anyways is a testimony to the amazing food and talent on display. The chef started us off with two salads meant for sharing: a heirloom tomato salad with a genius Fior di Latte fresh mozzarella; and a homemade canned tuna salad with red onion and olives. I could have just wallowed in them and never move on. Next came three, count them, three plates of pasta for two girls. Greedy girls. 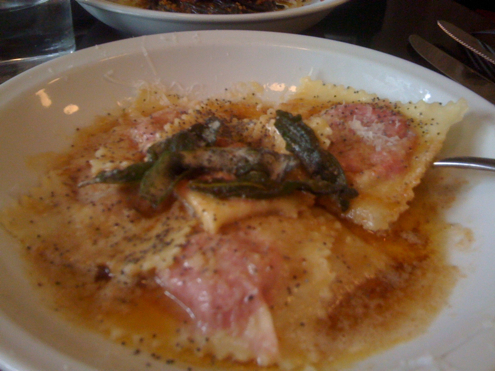 Here is the ravioli stuffed with beet-ricotta-orange-and sundry other goodies, dressed in brown butter and fried sage. By the way, some of the pasta were from the evening menu and a special treat from the chef on this sunny Friday noon. 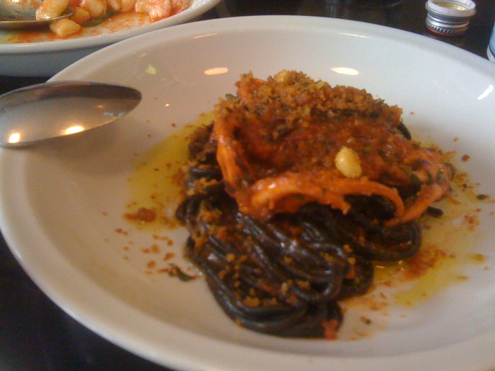 From Venti’s new fall menu and a bit of a primeur, the black-ink pasta with calamare in tomato sauce, fresh and bright and scrumptious. 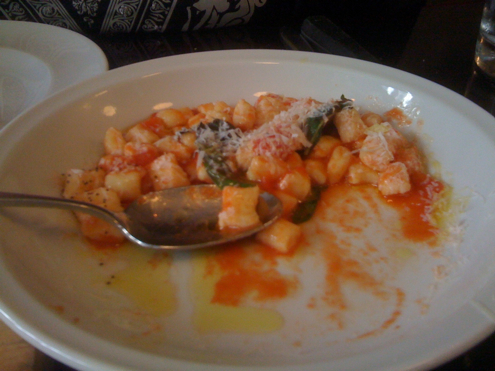 The ricotta gnocchi which the whole city is raving about, little pillows of heaven that sort of melt on your tongue. Okay, so I used to say I don’t like gnocchi so much. Until now. We had planned on skipping desserts since neither one of us has a sweet tooth. The chef thought otherwise and sent out four, count them, four desserts! 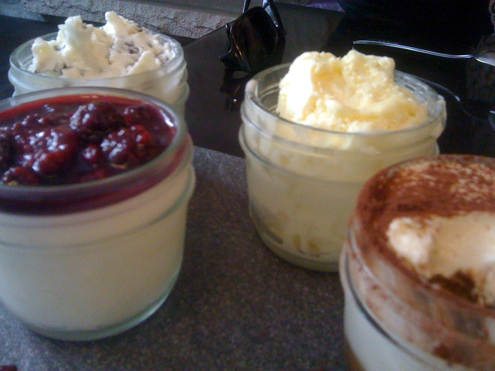 A panna cotta with berries, a stracciatella ice cream with chocolate, a limone semifreddo (I’m a lemon freak) and a tiramisu that has to be the best in town.